A World Cup downhill used, abused and approved sealant for Phil Atwill and friends to tubeless their tyres. 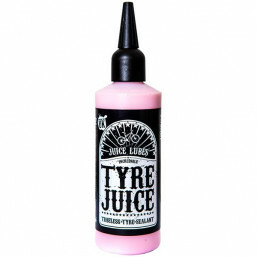 Tyre Juice wards off punctures and pinch-flats by coating your rubber in a protective force field. Slosh it in and you’ll enjoy a puncture-proof performance on the thorny roads and rocky trails. It’s a doddle to install and battles faff every time you ride. 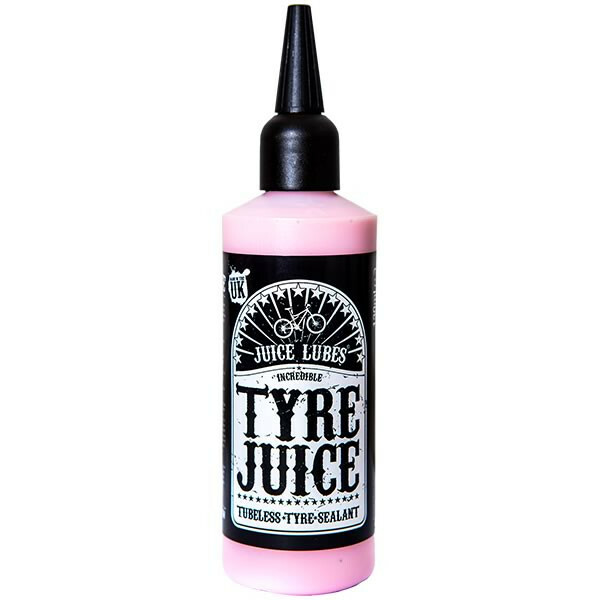 Tyre Juice works with all road and mountain bike tubeless and UST systems. Suitable for use with tubeless systems on all types of bike. Road, Cyclocross, MTB, Commuter. Synthetic formula is wheel and tyre friendly – anti corrosion formula. Can be easily washed from tyre and rim with water leaving a clean surface for future setups. Lasts longer than other latex based products. Finds the little cervices between the tyre bead and rim. Seals holes up to 5mm. Designed to function in all environments at varying temperatures without suffering separation, freezing or clotting. Prevents flat tyres and extends the useful life of a tyre. Multi sealing ability allows it to seal multiple holes with minimum pressure. Seals punctures with a strong airtight seal.